අද මම ඔයාලට පෙන්නන්න යන්නේ මම ලගකදී Home Automation System එකේ කරපු upgrade එකක් ගැනයි.මෙතැනදී මම කලේ RF Transmitter & RF Receiver වෙනුවට NRF24L01 කියන RF Transceiver එකක් සම්බන්ද කරපු එක. මම එහෙම කලේ මේ NRF24L01 කියන RF Transceiver එක RF Links වලට වඩා ගොඩක් powerful වගේම එකේ Transmit සහ Receive කරන data ගොඩක් වෙලාවට accurate.ඒ කියන්නේ garbage data transmit වෙන්නේ නැහැ.මෙතැනදී මේ NRF24L01 කියන module එකෙන් Transmit සහ Receive කියන වැඩ දෙකම කරනවා.එකයි මේකට Transceiver එකක් කියල කියන්නේ.අපි දැන් බලමු කොහොමද මේ module එකේ Pin Out වෙන්නේ කොහොමද කියල. මේ උඩ තියෙන පින්තුරයේ විදිහට මේ module එකට pins 8ක් තියෙනවා.ඒ වගේම මේ module එක වැඩ කරන්නේ 3.3V වලින්.ඒ කියන්නේ ඔයාල මේකට 5V supply කලොත් මේ module එක විනාශ වෙනවා.ඒ නිසා එක ගැන සැලකිලිමත් වෙන්න.මේ module එකෙන් අපිට වැඩක් ගන්න නම් , අපිට සිද්ද වෙනවා අපේ Arduino Board එකෙන් pins 5ක් වෙන් කරන්න මේ module එක සදහා.ඒ pins 5 තමයි 9 , 10 ( මේ පින් 2 සදහා D2 සිට D10 දක්වා ඇති අපිට කැමති pins දෙකක් දෙන්න පුළුවන්).11,12,13.මෙතැනදී මේ module එක Arduino එකත් එක්ක connect කරද්දී උඩ තියෙන chart එකේ විදිහට වරදන්නේ නැතුව දෙන්න වග බලාගන්න. අපි දැන් බලමු කොහොමද මේ Transceiver එක අපේ Home Automation System එකට සම්බන්ද කරන්නේ කියල. දැන් බලමු ඉහත රුපයේ විදිහට කොහොමද අපි connections දෙන්නේ කියල. ESP8266 module එකේ TX pin එක Arduino බෝඩ් එකේ D2 pin එකට connect කරන්න. 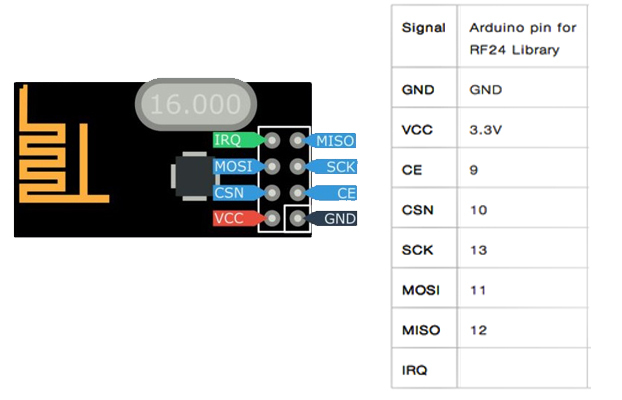 ESP8266 module එකේ RX pin එක Arduino බෝඩ් එකේ D3 pin එකට connect කරන්න. DC to DC converter එකේ +VOUT පින් එක ESP8622 module එකේ VCC සහ CH_PD එකටත් connect කරන්න. Display එකේ GND පින් එක dc to dc Converter-VOUT පින් එකට connect කරන්න. පලවෙනි Shift Register එකේ DS(14) පින් එක Arduino බෝඩ් එකේ D4 pin එකට connect කරන්න. පලවෙනි Shift Register එකේ OE(13) පින් එක GND එකට connect කරන්න. පලවෙනි Shift Register එකේ ST_CP(12) පින් එක Arduino බෝඩ් එකේ D5 pin එකට connect කරන්න. පලවෙනි Shift Register එකේ SH_CP(11) පින් එක Arduino බෝඩ් එකේ D6 pin එකට connect කරන්න. පලවෙනි Shift Register එකේ MR(10) පින් එකට 5V connect කරන්න. පලවෙනි Shift Register එකේ VCC(16) පින් එකට 5V connect කරන්න. පලවෙනි Relay module එකේ GND pin එක GND එකට connect කරන්න. පලවෙනි Relay module එකේ VCC පින් එකට 5V connect කරන්න. පලවෙනි Relay module එකේ IN1 pin එක පලවෙනි Shift Register එකේ Q0 pin(15) එකට connect කරන්න. පලවෙනි Relay module එකේ IN2 pin එක පලවෙනි Shift Register එකේ Q1 pin(1) එකට connect කරන්න. පලවෙනි Relay module එකේ IN3 pin එක පලවෙනි Shift Register එකේ Q2 pin(2) එකට connect කරන්න. පලවෙනි Relay module එකේ IN4 pin එක පලවෙනි Shift Register එකේ Q3 pin(3) එකට connect කරන්න. පලවෙනි Relay module එකේ IN5 pin එක පලවෙනි Shift Register එකේ Q4 pin(4) එකට connect කරන්න. පලවෙනි Relay module එකේ IN6 pin එක පලවෙනි Shift Register එකේ Q5 pin(5) එකට connect කරන්න. පලවෙනි Relay module එකේ IN7 pin එක පලවෙනි Shift Register එකේ Q6 pin(6) එකට connect කරන්න. පලවෙනි Relay module එකේ IN8 pin එක පලවෙනි Shift Register එකේ Q7 pin(7) එකට connect කරන්න. දෙවෙනි Shift Register එකේ DS(14) පින් එක පලවෙනි Shift Register එකේ DOUT pin(9) එකට connect කරන්න. දෙවෙනි Shift Register එකේ OE(13) පින් එක GND එකට connect කරන්න. 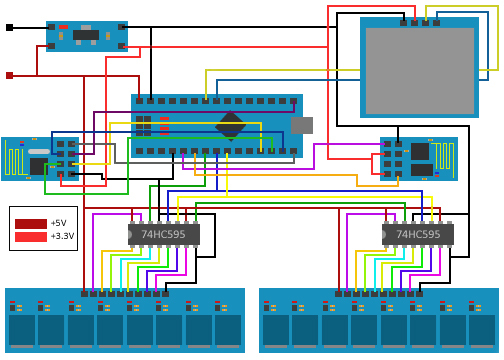 දෙවෙනි Shift Register එකේ ST_CP(12) පින් එක Arduino බෝඩ් එකේ D5 pin එකට connect කරන්න. දෙවෙනි Shift Register එකේ SH_CP(11) පින් එක Arduino බෝඩ් එකේ D6 pin එකට connect කරන්න. දෙවෙනි Shift Register එකේ MR(10) පින් එකට 5V connect කරන්න. දෙවෙනි Shift Register එකේ VCC(16) පින් එකට 5V connect කරන්න. දෙවෙනි Relay module එකේ GND pin එක GND එකට connect කරන්න. දෙවෙනි Relay module එකේ VCC පින් එකට 5V connect කරන්න. දෙවෙනි Relay module එකේ IN1 pin එක දෙවෙනි Shift Register එකේ Q0 pin(15) එකට connect කරන්න. දෙවෙනි Relay module එකේ IN2 pin එක දෙවෙනි Shift Register එකේ Q1 pin(1) එකට connect කරන්න. දෙවෙනි Relay module එකේ IN3 pin එක දෙවෙනි Shift Register එකේ Q2 pin(2) එකට connect කරන්න. දෙවෙනි Relay module එකේ IN4 pin එක දෙවෙනි Shift Register එකේ Q3 pin(3) එකට connect කරන්න. දෙවෙනි Relay module එකේ IN5 pin එක දෙවෙනි Shift Register එකේ Q4 pin(4) එකට connect කරන්න. දෙවෙනි Relay module එකේ IN6 pin එක දෙවෙනි Shift Register එකේ Q5 pin(5) එකට connect කරන්න. දෙවෙනි Relay module එකේ IN7 pin එකදෙවෙනි Shift Register එකේ Q6 pin(6) එකට connect කරන්න. දෙවෙනි Relay module එකේ IN8 pin එක දෙවෙනි Shift Register එකේ Q7 pin(7) එකට connect කරන්න. NRF24L01 Transceiver එකේ +VIN පින් එක 3.3V අග්‍රයක් සම්බන්ධ කරන්න. DC to DC converter එකේ +VIN පින් එක 5V ධන අග්‍රයක් සම්බන්ධ කරන්න. DC to DC converter එකේ -VIN පින් එක 5V ඍන අග්‍රයක් සම්බන්ධ කරන්න. Main Control Unit එකේ ඔය විදිහට connection හැදුවට පස්සේ , අපිට තියෙන්නේ sensor unit එකටත් NRF24L01 Transceiver එක සම්බන්ද කරගන්න.අපි ඊලග පොස්ට් එකෙන් බලමු කොහොමද sensor unit එකේ modules connect කරගන්නේ කියල.